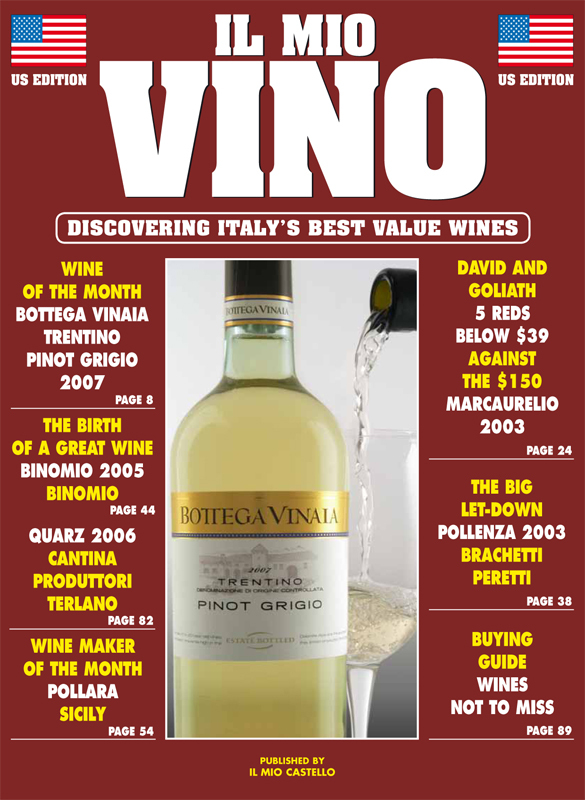 Il Mio Vino is a very popular and reputable magazine but if you wanted it, you could only buy it on newstands in Italy. Until today. Finally, Il Mio Vino has landed in America and it’s in English. It is only online and – best of all – it’s free. Therefore, subscribe here. It covers only Italian wines and its ratings are given by a blind panel of leading Italian experts. You can’t go wrong. Subscribe here. I must also say that Gaetano Manti, the publisher of Il Mio Vino is one of our closest friends. I wish him all the best with this new venture. I, for one, would like to sell some of these great Italian wines. Shall we start? Who is in favor? AS SEEN ON IL MIO VINO: Gustiamo‘s beautiful and colorful ad. You can do a search on Il Mio Vino with “Gustiamo”, or, you can go directly to pages 10, 23 and 51. Products featured in this issue are: Pasta Latini, the Piennolo Tomatoes, and Antichi Uliveti EV Olive Oil.